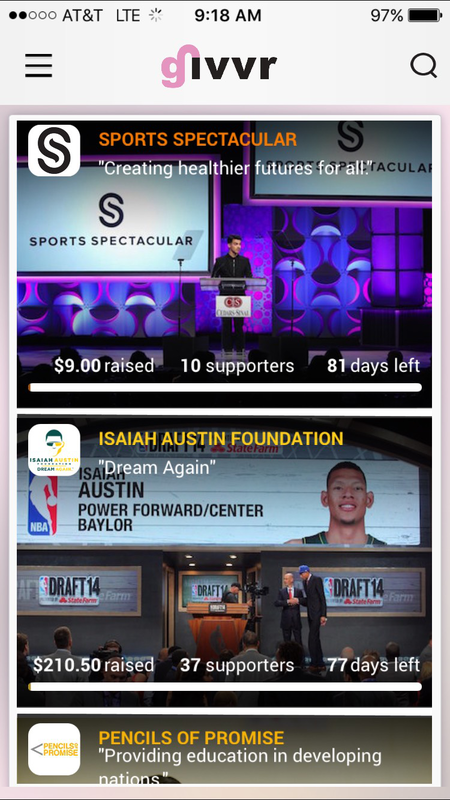 Giving Tuesday: New app Givvr funds charities when you watch videos. A few of the nonprofits available. As you evaluate the charitable landscape this Giving Tuesday, it’s tempting to dismiss the new app Givvr because it fits so well into narratives of millennial lassitude. Though those narratives may have more to do with our distaste for contemporary technology than they do with the realities of generational malaise, they’re surprisingly resonant here. When you boot it up, Givvr invites you to choose from one of a list of charitable causes, among them the Epilepsy Foundation of Greater Los Angeles and the Arbor Day Foundation. Make your selection, and a short video about the cause will play. Each time someone watches that video, a donor has pledged to make a small contribution to the attached nonprofit. You don’t need to do anything more—unless, of course, you want to invite your Twitter followers or Facebook friends to join in. For now, CEO Malte Kramer told me, the donors are mostly individuals, largely drawn from his co-founder’s personal network, which helps explain why so many of them are currently regionally specific to Southern California. Ultimately, however, the young company hopes to involve more established brands in the process. While all of the money raised through the app currently goes to the nonprofits, Kramer explained that his company will ultimately support itself by charging these sponsor-donors a small handling fee. Givvr promises to offer a maximal collective return on a minimal personal investment. In this regard, it’s not entirely new. A descendant of the click-to-give-sites—which claimed to donate some or all of their ad revenue to charitable causes—that have been around since at least the mid-aughts, Givvr is a modern variant on an established model. But Kramer suggested his app tries to push the format forward by “making it social and making it mobile.” The former may be the more important of the company’s innovations: By encouraging users to spread videos through Facebook, Twitter, and so on, it hopes to amplify awareness while also raising funds. Kramer hopes that the established brands the company is courting won’t see their contributions to the app “as an alternative to doing a pre-roll ad on Youtube.” Instead, the company plans to continue to show videos for and about the causes it’s promoting. “It’s a new way of reaching an audience, the socially conscious millennial” that can otherwise be difficult to target. Kramer proposes that while sponsors may attach their logos to videos, they’ll mostly stay out of the picture. If it works, it’ll work because millennials really do want to make a difference. There’s still reason to be cynical, not least of all because Givvr appears to be developing itself as a stage on which corporations can perform their goodness. To be sure, companies do just that all the time, but here the app’s users also get in on the act, acquiring the illusion of involvement. That’s only really a problem if it keeps them from doing other charitable work, leaving them with the feeling that by partially intervening in the flow of someone else’s money—money that probably would have found its way to its target regardless—they’ve done enough good. It’s still possible that Givvr might raise actual awareness to worthy causes. But awareness alone is rarely enough, especially when it comes with the idea that you’ve already, well, given. In the long term, however, the real trouble may be with Givvr’s corporate aspirations. Though Kramer told me the company insists on funding only well-vetted nonprofits, it will also, by structural necessity, end up supporting corporate-friendly causes. In the process, it may drain some of the grass-roots gumption that makes Internet activism meaningful. Millennials aren’t the problem, then—capitalism is. Isn’t it always?